The summer I was 10 or so, my parents signed me up for a kids’ art class at the local art school/museum. One of our first projects was to stand at an easel (cool!) to paint fireworks. I covered my paper with dark colors for the night sky, then painstakingly got to work painting the fine details of the fireworks display I’d seen the night before. I love the ones that look like chrysanthemums…huge and bursting with fine streaks of color and light. The instructor made his way around the class, and when he got to me, he took a wide brush in his hand, dipped it in paint, and painted RIGHT OVER my finely detailed work with his own wild and broad strokes. “THIS is how fireworks look!” he blared as he painted. I remember feeling like I was painting “wrong” and wanting to go home. I was 10 then. I’m 57 now. I should just get over this. But the nagging idea that got into my head that day—that art is something with right and wrong answers, like trigonometry—never left me. Even then I knew, as he was ruining my painting and my psyche, that I was entitled to my own interpretation of fireworks—but that criticism somehow crippled me. I shy away from art—though I ADORE art supplies—because I don’t want to get it wrong. I need to shake this. I faithfully listen to Ana Reinert’s and Heather Rivard’s “Art Supply Posse” podcast and this has been the just the thing to nudge me in the right direction. When I drive to and from out-of-town doctor’s appointments, I devour the episodes and the advice. They leave me saying “I can do this.” I want to do this. I WILL do this. At the DC Pen Show, Ana recommended that I check out books by Danny Gregory. 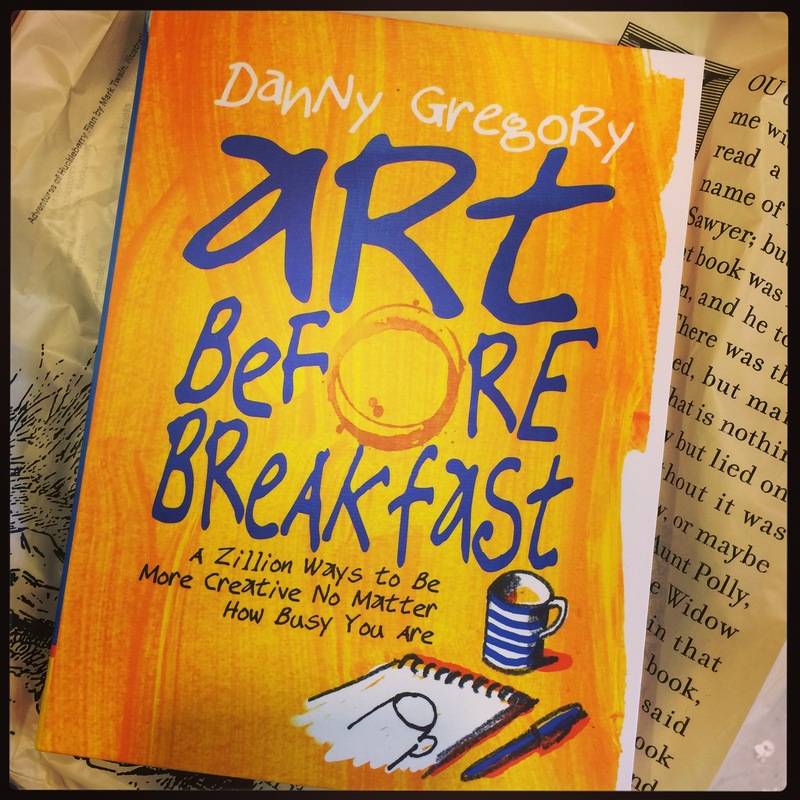 As with all things art, I characteristically dragged my feet, but this week I finally picked up a copy of his Art Before Breakfast. Merry Christmas to me! I haven’t had time to do much more then leaf through the pages, but I’m already excited. I’m going to make art. Bad art. Good art. Right art. Wrong art. Quick art. Slow art. Art. 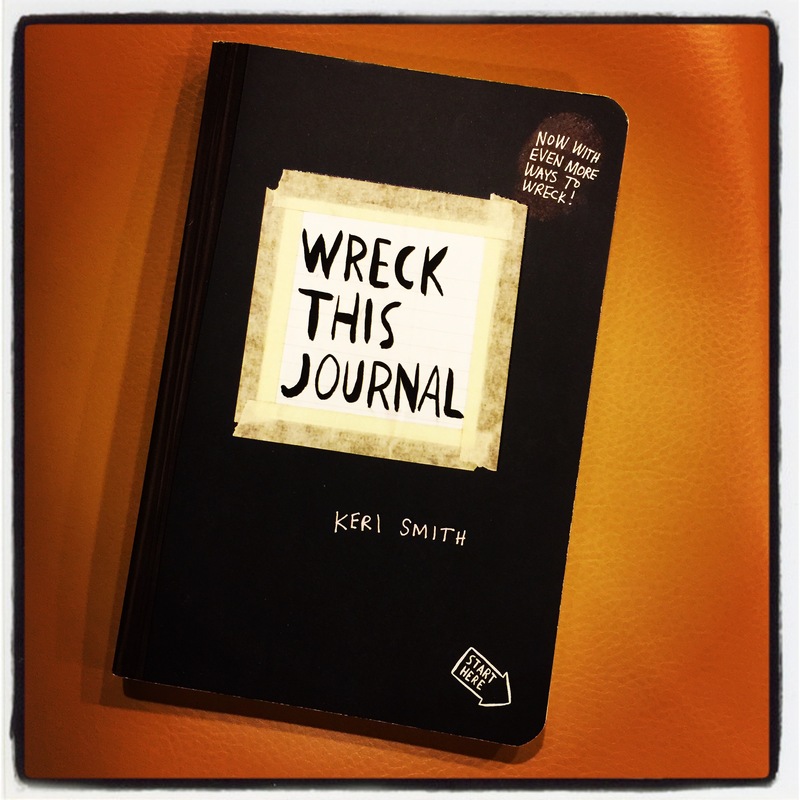 About a year ago, a friend sent me a copy of Keri Smith’s Wreck This Journal. She bought a copy for herself and the plan was for us to wreck our journals simultaneously, then mail them to each other to see who was the most destructive. We have similar personalities and the idea of wrecking something, especially a book, does not come easily. My book remains pristine, and, last time I checked, hers was in the same condition. Ah, perfectionism. What a cruel master. 2017 is the year to let loose. I will wreck this book. I will mail it to Teresa in all of its destroyed glory. I will. Our dining room is in relatively good shape, except for this piece of real estate. Ouch. You can tell by the boxes that I’ve tried to get a grip on things, but then the going gets tough and my will to continue dries up. I’m vowing, publicly, to sort, organize, and store all of the pens, pencils, and notebooks you see here. I also vow to use them. There is much work to be done, but it’s fun work. 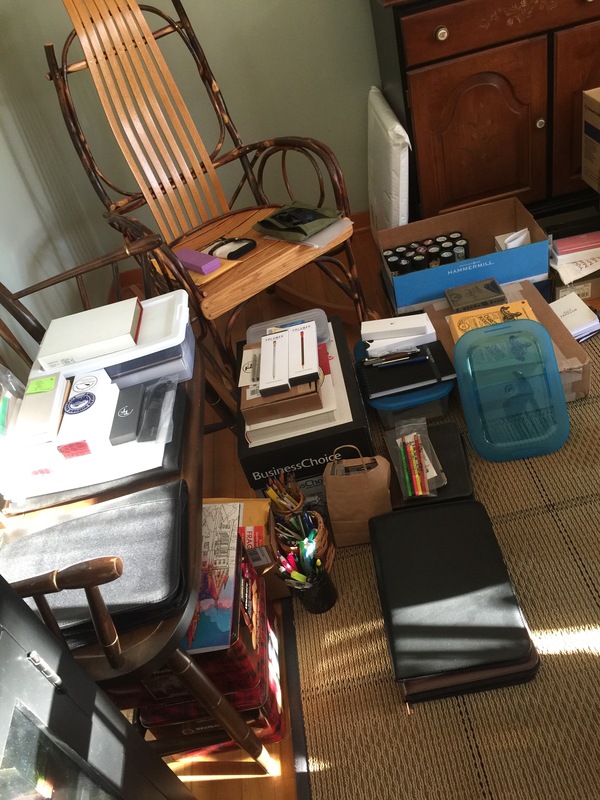 Making art, letting loose, organizing and using my stationery treasures. A footnote about the art school experience: Decades after that unfortunate summer class, I returned to the Adult Community Art Classes to take a bookmaking/printmaking class and had the time of my life. Even though I was the “scientist” in a class full of artists, I had a blast making books because there is measuring and right angles. The professor, who remains a good friend, never told me that I was doing things wrong. She let me be as precise as I wanted to be while encouraging me to let loose. She was everything that summer instructor was not. I love you, Lisa.